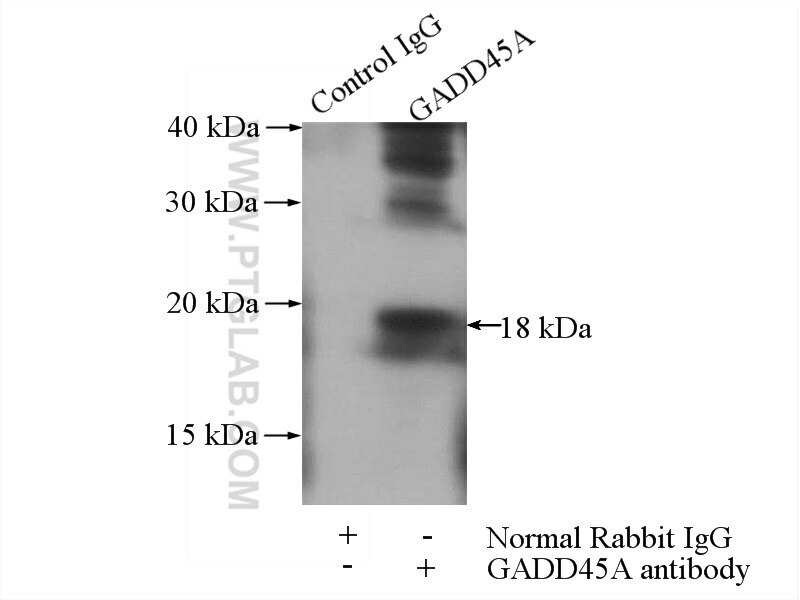 IP Result of anti-GADD45A (IP:13747-1-AP, 4ug; Detection:13747-1-AP 1:500) with K-562 cells lysate 3200ug. GADD45A, also named as DDIT1 and GADD45, belongs to the GADD45 family. It binds to proliferating cell nuclear antigen. GADD45A may affect PCNA interaction with some CDK (cell division protein kinase) complexes; stimulates DNA excision repair in vitro and inhibits entry of cells into S phase. GADD45A plays an essential role in active DNA demethylation during terminal osteogenic differentiation of adipose-derived mesenchymal stem cells. GADD45A has Dimer (~36 kDa) and Mono (~18 kDa) forms (PMID:11498536). Flavagline analog FL3 induces cell cycle arrest in urothelial carcinoma cell of the bladder by inhibiting the Akt/PHB interaction to activate the GADD45α pathway. Down-regulation of GADD45A enhances chemosensitivity in melanoma. Overexpression of HP1γ is associated with poor prognosis in non-small cell lung cancer cell through promoting cell survival. miR-124 and miR-9 Mediated Downregulation of HDAC5 Promotes Neurite Development Through Activating MEF2C- GPM6A Pathway.